trade safely internationally, whether your customers are in the Australia New Zealand, EU or further afield. 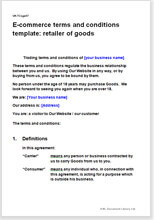 The terms and conditions are valid for businesses based anywhere in the Australia. This template complies with the Sale of Goods Act .The Competition and Consumer Act 2010, and other latest consumer protection legislation allowing you to sell to businesses or consumers. Where statute law could apply, the T&C have been drawn then applies to specific circumstances, for example, we have included provisions to comply with the Product Stewardship (Televisions and Computers) Regulations, 2011 but these are only relevant if the type of goods sold is electronic or electrical.